The elves called it something that translates to “The Silent Home of Those Who See From Beyond The Veil Of Worlds And Time” or something similar. More recent translations of elven texts tend to call it the “Hall of the Ancient Eyes” or the “Hall of the Ancient Ones”. The texts usually referenced the hall in passing, but a few choice excerpts describe it as a place where otherworldly entities see into this world, and where some sorcerers, mystics, and warlocks would communicate with outworld patrons. But of course, the one or two texts that actually mention where the Hall is have been taken by looters with no concept of their value, or destroyed in the collapse of the elven empire. And there are plenty of “sorcerers, mystics, and warlocks” who would love to find it in order to communicate with creatures from beyond the veil of worlds. It is believed that each of the crystalline pillars in the hall acts as an “eye” for one or more alien entities, allowing them to collect information directly from those who present themselves here. Of course, with competing eyes only ten feet away, much communication was done using weird chaos-based cypher systems, innuendo, and outright campaigns of misinformation. 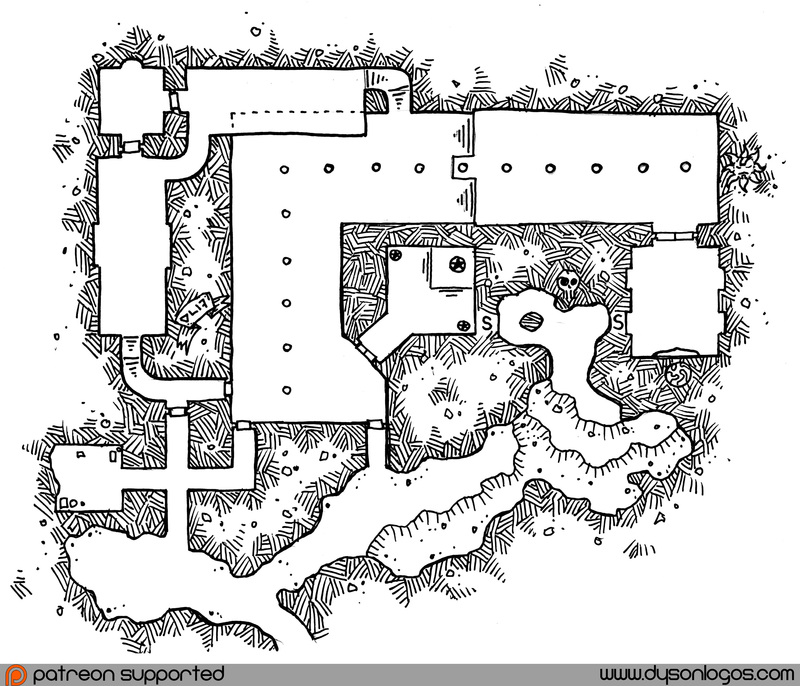 This particular map was drawn with a very different tool set than I normally use these days. In a throwback to how I worked in 2013, this was drawn using only a single 0.7mm gel pen instead of a variety of thicknesses of technical pens. I was sitting on the couch watching Farscape when I saw a pad of paper on the table and one of the exact pens I used to use for all my cartography and just… felt inspired.